For some time now, surveys have shown that younger Americans are less likely than older adults to attend church, believe in God, or say religion is important to them. 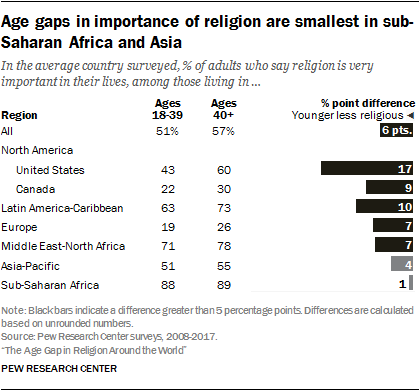 Such a religion age gap doesn’t exist in every country, but a new Pew Research Center study shows that it is far from unique to the United States. 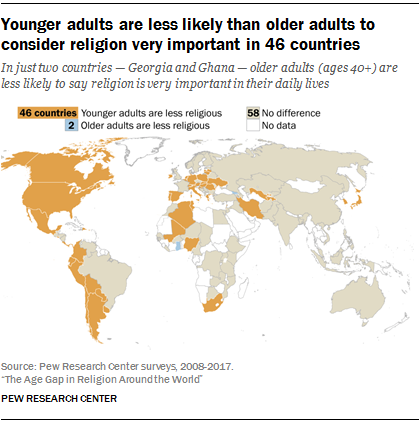 In fact, in 46 countries around the world, adults under age 40 are less likely to say religion is “very important” in their lives than are older adults; the opposite is true in only two countries. In 58 countries, there are no significant age gaps on this question, according to surveys conducted in more than 100 nations. While the size of the age gap varies from country to country, averaging the national results in each of the countries surveyed yields a clear global picture: 51% of younger adults in the average country consider religion to be very important, compared with 57% among people ages 40 and older – a difference of 6 percentage points. In the U.S., the age gap is considerable: 43% of people under age 40 say religion is very important to them, compared with 60% of adults ages 40 and over. Age gaps also are especially common in Latin America, with gaps appearing in 14 out of 19 countries. In the average country in the region, 63% of young adults consider religion to be very important, compared with 73% of their elders. In Europe, an age gap appears in 18 out of 35 countries, with 19% of young adults in the average country and 26% of their elders saying religion is very important in their lives. Europe also is home to several nations with some of the world’s widest country-level gaps, including Poland, where just 16% of adults under 40 say religion is very important, compared with 40% of older people who say this. Older Poles may be significantly more religious in part because they were more affected by the Cold War, a time when the Catholic Church was associated with Polish nationalism and resistance to the Soviet Union. Other measures of religious commitment also show an age gap in many nations. Younger respondents are less likely to identify with any religion in 41 countries; again, the opposite is true in only two countries. Similar patterns emerge when examining rates of daily prayer and attendance at worship services. Studies have suggested different but possibly overlapping explanations for the age gap in religion. One theory is that people naturally become more religious as they age and approach their own mortality. Another is that societies become less religious as economic conditions improve and people face fewer anxiety-inducing or life-threatening problems. Since young people in steadily developing societies generally have easier lives than their elders, this theory goes, they are less religious. However, it would be a mistake to assume the world overall is becoming less religious just because young people are less devout. In fact, many of the world’s least religious countries have populations that are either shrinking or growing only slowly, while regions with the highest population growth tend to be very religious. For example, sub-Saharan Africa – which has the world’s fastest population growth – also has the smallest age gap on importance of religion and has a high rate of religious commitment overall. In the average country in the region, 88% of younger adults and 89% of older adults say that religion is very important in their lives. Stephanie Kramer is a research associate focusing on religion at Pew Research Center. Dalia Fahmy is a senior writer/editor focusing on religion at Pew Research Center.